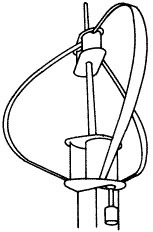 A Darrieus is a type of vertical axis wind turbine (VAWT) generator. Unlike the Savonius wind turbine, the Darrieus is a lift-type VAWT. 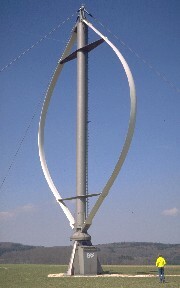 Rather than collecting the wind in cups dragging the turbine around, a Darrieus uses lift forces generated by the wind hitting aerofoils to create rotation. A Darrieus wind turbine can spin at many times the speed of the wind hitting it (i.e. the tip speed ratio(TSR) is greater than 1). Hence a Darrieus wind turbine generates less torque than a Savonius but it rotates much faster. This makes Darrieus wind turbines much better suited to electricity generation rather than water pumping and similar activities. The centrifugal forces generated by a Darrieus turbine are very large and act on the turbine blades which therefore have to be very strong – however the forces on the bearings and generator are usually lower than are the case with a Savonius. Darrieus wind turbines are not self-starting. Therefore a small powered motor is required to start off the rotation, and then when it has enough speed the wind passing across the aerofoils starts to generate torque and the rotor is driven around by the wind. An alternative is shown in the illustration above. Two small Savonius rotors are mounted on the shaft of the Darrieus turbine to start rotation. These slow down the Darrieus turbine when it gets going however they make the whole device a lot simpler and easier to maintain. Variants of the Darrieus wind turbine are the giromill and cycloturbine.